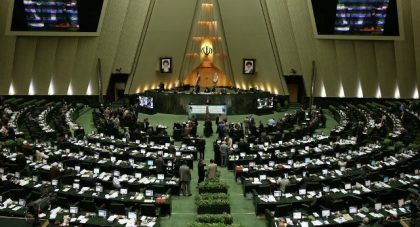 Hardliners in Iran’s parliament burnt a US flag in the chamber early Wednesday, after US President Donald Trump announced his decision to withdraw from the 2015 nuclear deal with Tehran. The parliamentarians shouted “Down with America” and burnt a symbolic copy of the deal as well, according to the Iranian news agency ISNA, which published a picture of five lawmakers taking part. Iran’s hardliners had always been opposed to the deal, which was aimed at halting Iran’s nuclear weapons programme in exchange for the easing of economic sanctions, and have attacked President Hassan Rowhani for signing it. Trump’s announcement represented a decisive break with his European allies, who had lobbied him hard to keep the pact in place, arguing that there was no viable alternative. After his statement on Tuesday, Germany, France and Britain announced that they would “remain parties” to the agreement, formally known as the Joint Comprehensive Plan of Action (JCPOA), while Rowhani said that Tehran would also work to uphold it. The French, British and German foreign ministers would meet with officials from Tehran on Monday to discuss how to move forward, French Foreign Minister Jean-Yves Le Drian told French radio station RTL early Wednesday. Iranian Foreign Minister Javad Zarif wrote on Twitter that Iran’s commitment depended on its remaining partners in the deal, which also include China and Russia. “I’ll spearhead a diplomatic effort to examine whether remaining JCPOA participants can ensure its full benefits for Iran. Outcome will determine our response,” he said.